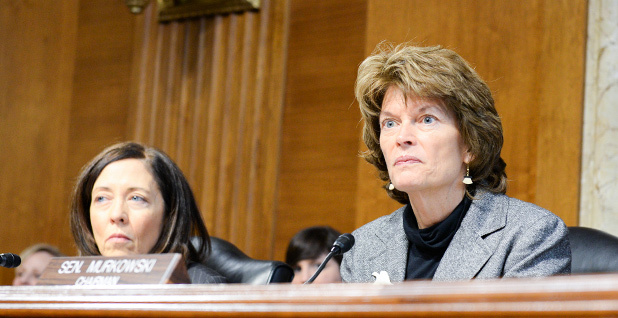 Senate Energy and Natural Resources Chairwoman Lisa Murkowski (R-Alaska) and ranking member Maria Cantwell (D-Wash.). Both are trying to keep energy reform legislation talks alive. Photo courtesy of Murkowski’s office via Flickr. This story was updated at 10:35 a.m. EST. Top conferees huddled yesterday behind closed doors in the Capitol to assess the state of the first formal energy conference in more than a decade, as the clock ticks on what is expected to be a relatively short lame-duck session. Senate Energy and Natural Resources Chairwoman Lisa Murkowski (R-Alaska) told reporters afterward that she is waiting to receive a counteroffer from the House after the Senate last month sent a "quite considerable" proposal across the Capitol. "We're waiting to get back a proposal, also something more concrete than just words," Murkowski said. "Because in fairness, some of the communications back, at least at the staff level at the beginning of the week, was not as positive as we would have liked in the sense that it would have removed from consideration some priorities, like the LNG provision that we had in our piece." Other items the House has signaled they want dropped include energy efficiency and innovation provisions, critical minerals, pipeline permitting reforms included in the Senate bill, reforms to the Energy Department's loan guarantee program, hydropower provisions popular with members of both parties, a sportsmen's package, as well as language commemorating the National Park Centennial. Murkowski said she expected a counterproposal from the House today and signaled talks will continue over the Thanksgiving break. "My hope is that the same good faith negotiations that have gone on will put us in a position so that when we return after Thanksgiving, we will be able to move forward," she said. But the House's apparent willingness to punt on much of the scope of the conference talks threatens to upend nearly two years of work on the reform push to break a decadelong stalemate over major energy legislation. Staff have spent the past two-and-a-half months in dozens of extended meetings trying to bridge the gap between the chambers' competing bills. Those talks culminated in the October submission to the House of a draft conference report that Murkowski said was hundreds of pages long and contained numerous changes to address issues raised by the House. Energy and Natural Resources Committee ranking member Maria Cantwell (D-Wash.) said that proposal included reforms to the permanent reauthorization of the Land and Water Conservation Fund that the Senate passed but was a sticking point in the House. "It had a very long, long period of time, let's just say," Cantwell said of the authorized period that was sent to the House. A senior Senate aide was "baffled" by House signals that LNG exports should be left off the table, saying "we have no idea why." Top Republicans have repeatedly cited the LNG export provision as a key reason for finishing the energy bill, a point reiterated by Senate Republican Policy Chairman John Barrasso (R-Wyo.) earlier this week (Greenwire, Nov. 15). Major industry groups strongly support the provision, which was included in both the House and Senate bills, although the chambers' respective provisions differ only by a 15-day difference on the shot clock imposed on DOE. Industry also wants to see permitting reforms for pipelines. A spokesman for Energy and Commerce Chairman Fred Upton (R-Mich.) did not respond to a request for comment last night. The turmoil also threatens to scuttle one unexpected breakthrough that has eluded lawmakers for years — tackling Western drought. "We're optimistic on water, on California water," said Murkowski. California lawmakers, Democratic Sen. Dianne Feinstein and several House Republicans have sought to pass legislation to tweak the operations of the Golden State's massive water projects to allow more water to farms and cities. By law, the agencies managing the systems must save a portion of the water to maintain habitat for threatened species, like the tiny delta smelt. California's multiyear drought has intensified the competition between users. Lawmakers hope to pass some solution in the lame duck, before the state's rainy winter season creates what they see as another missed opportunity to divert water for human uses. "Pressure can create motivation to get some things done," said Murkowski. The lawmakers are also making progress on a broader, Westwide water package with provisions on the Yakima River Basin in Washington state, the Klamath River Basin in Oregon and California, the Fontenelle Reservoir in Wyoming and Equus Beds in Kansas. Yesterday's meeting follows a week of mixed signals from lawmakers over the conference process, which was thrown for a loop by the surprise election of Donald Trump as the next president and GOP retention of Senate control in the next Congress. House lawmakers all week have acknowledged that the GOP sweep has blunted the chamber's appetite for negotiating in the lame duck. But Murkowski and Cantwell noted that the math for passing legislation in the Senate will be harder for Republicans in the 115th Congress. "If you're sitting in the House, you've got an alignment that seemingly makes things easy — that you can just start afresh next year and kick some things out," Murkowski said. "If you're here in the Senate, our reality is that with the election, on the Republican side, it brought about two less seats. So when you're trying to get something moved through the Senate any more, the magic number is not 51, it's 60. And so our reality is that the election in many ways is going to make things more challenging to advance things through the Senate." Key House conferees have sent mixed signals on the conference process all week. Upton earlier in the week signaled the conference was likely to punt until next year, but he changed his tone yesterday, telling reporters his earlier remarks were "wrong." "I got more information," he said. "There are some things that we can do, and we're not willing to throw in the towel at this point." Rep. John Shimkus (R-Ill.), who along with Rep. Greg Walden (R-Ore.) is a leading contender to replace Upton as the Energy and Commerce Committee chairman next year, said he and other conferees are "not hearing a lot of vested interest from the outside saying finish this." "So that quiet forces people to prioritize certain ways," he told E&E News. House Natural Resources Chairman Rob Bishop (R-Utah) has sounded more optimistic about the talks this week, following what he described as a positive meeting with Cantwell in his home state last week. Yesterday he called the sportsman's package "essential." A Bishop spokeswoman today said work continues "on a bipartisan, bicameral package." Bishop told reporters as he left that the meeting was "pleasant" and "cordial" but sounded less positive. "I think there are some things that can be done that are almost consensus right now," he said. "But, like I said, with every day from Monday, my optimism kind of fades." Cantwell, who was reluctant to enter conference talks after House Republicans added a host of controversies to their bill, expressed frustration that two years of work may end up without a result. "We would hate to see the culmination of that be important national policy priorities left unresolved — basically, not finish the job. And we would hate to see people just leave here without finishing that work and then thinking that they could just start over in another year, which would again be a very elongated process," she said. "We wouldn't be back to these issues for a long time. ... So we're encouraging our colleagues to look at those priorities and get their job done, as it relates to these House and Senate priorities. And let's see if we can't use this window to finish our work before we just go home." Reporters Tiffany Stecker and Arianna Skibell contributed.